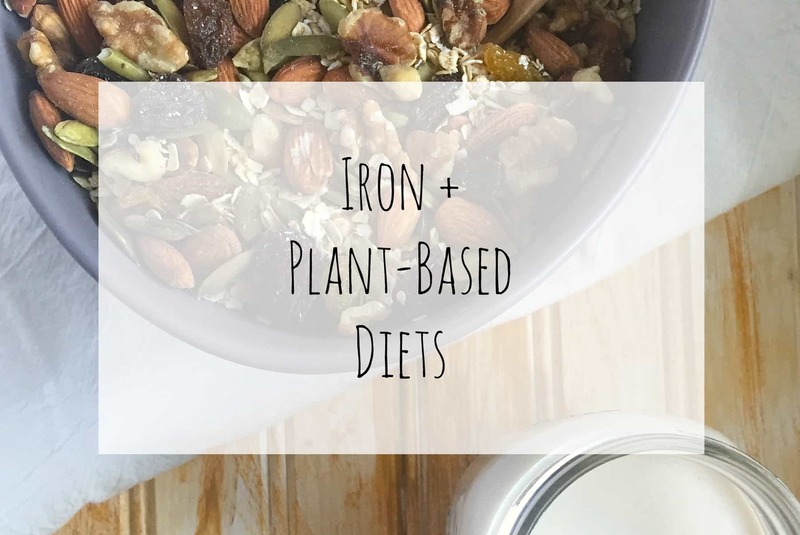 Aside from protein and calcium, one of the most common concerns I hear about plant-based diets is that they may not provide enough iron. Iron deficiency is the most common nutrient deficiency in the world and it’s true that vegetarians tend to have lower levels, so let’s talk about how we can make sure that we’re getting enough of this essential mineral. Most of the iron in our bodies is found within our red blood cells (in our hemoglobin, to be exact). Here, iron is involved with transporting oxygen throughout our entire bodies. Iron is also a component of myoglobin, which transports oxygen to our muscle cells. Because of this, iron is essential for giving us the energy we need to go about our day. Iron deficiency is the most common nutrient deficiency and is most common in children and young women. Iron deficiency can lead to anemia, which is characterized by fatigue, shortness of breath while exercising, and a fast heartbeat. There are two different types of iron – heme (from animals) and non-heme (from plants). Its true that heme iron (the type from animals) is more easily absorbed than non-heme iron. Some plant foods also contain compounds that can block iron absorption, like phytates and tannins. Some experts disagree about whether vegetarians need to consume more iron in order to make up for this difference in absorption. Bonus: Maximize your veg iron! Beyond including a variety of the above plant-based iron sources, there are some additional ways for vegetarians to maximize iron intake and absorption. 1. Combine iron and vitamin C.
Iron absorption is increased when its combined with vitamin C, so we can give our cells more iron by combining iron-rich beans and whole grains with vitamin C-rich vegetables and fruits. (Think adding salsa and lime to your black bean burrito bowl.) Some plant foods also work double duty and provide both iron and vitamin C (broccoli, swiss chard, tomato sauce). 2. Cook with cast iron. My cast iron skillet is one of my favorite kitchen tools and not only because it provides a safe non-stick cooking surface. Cooking with cast iron can add a significant amount of iron to our food, especially when cooking something acidic (like tomatoes). 3. Avoid coffee, tea, and calcium supplements with high-iron meals. Coffee and tea contain tannins, which can block iron absorption. Ditto for calcium supplements. To avoid this, simply drink coffee and tea in between meals and avoid taking calcium supplements with a meal that is particularly high in iron. If you’re eating a well-balanced plant-based diet (including a wide variety of legumes, whole grains, and nuts) and you’re getting plenty of vitamin C (from brightly-colored vegetables and fruits) you shouldn’t need to worry too much about your iron status. Iron deficiency is very real, though, so be sure to ask your physician for a blood test if you’re experiencing any of the deficiency symptoms I mentioned above! Great post! I’m pinning so I can share with clients! great info Steph! Sharing now! I love the easy to understand information here. I’m a vegetarian, and I’ve had issues with anemia in the past. I think this is so important for people to know! Nutrition a la Natalie recently posted…Matcha Madness: It Is Worth The Hype? Thanks for this info! My husband and I have been vegetarian for 4 years. After beginning to donate blood regularly, I started struggling with iron. Then just recently my husband has been as well, and we’re not sure why. We try to eat very intentionally to ensure that we’re consuming a lot of iron sources and now we’re both even on supplements. Now I’m thinking how we can better combine it with vitamin C perhaps to help.